This classic recipe is a staple in our house and we probably end up making our Garlic and Herb Chicken about once a week. We love it because it’s easy, which makes it the perfect dinner during the week. We pair it up a thousand ways – sometimes with a simple veggie, like our Wilted Baby Spinach, or if we are wanting comfort, we choose a cheesy starch such as our Rockin Mac and Cheese, or we go healthy with a delicious salad like our Walnut Salad with Honey Clementine Vinaigrette. To a small prep bowl, add chopped herbs with garlic, onion and a good pinch of salt and pepper. 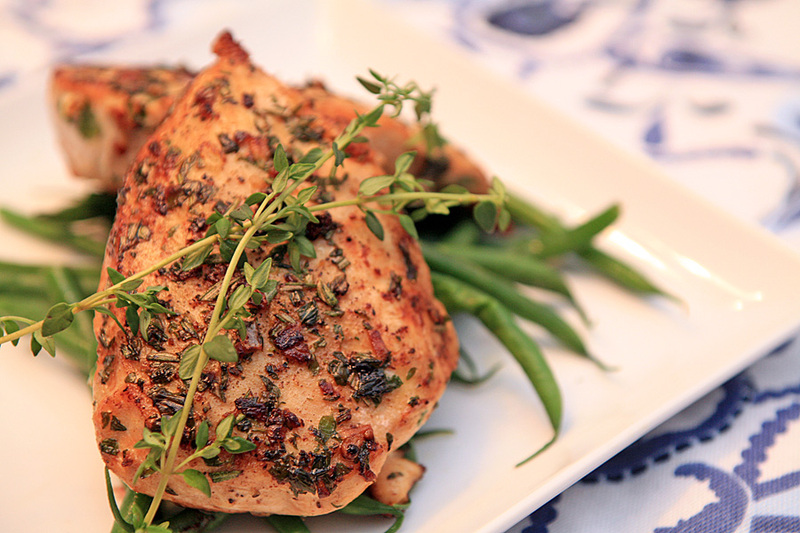 Drizzle olive oil over both chicken breasts and liberally season both sides with herb mixture. Try to press the seasoning into the chicken, creating a crust. Place a skillet over medium heat and melt down butter with a drizzle of olive oil. Make sure you add enough to have a good 1/4 inch coating. Once the butter melts, add your chicken to the pan. Allow to cook for about 4 minutes. Tilt your pan to allow your butter to gather. Use a spoon to collect the butter and pour over top of the chicken. This method is called basting and it will help keep your chicken moist and tender. Do this about 10 times. Once the cooking time reaches 6 minutes, flip the chicken. Allow to cook for 1-2 minutes and repeat the basting method until the chicken reaches an internal temp of 165. Remove from heat and allow to rest. I made this tonight. My husband loved it. He called it “SUPER GOOD!” It was also super easy, lol. Thank you!!!!! !